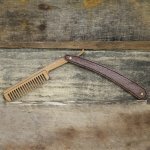 This is a small handmade beard comb that is designed to look like a vintage straight razor. 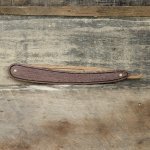 This unique comb is crafted with walnut or padauk scales which can be personalized with your favorite initials, nickname, or monogram. 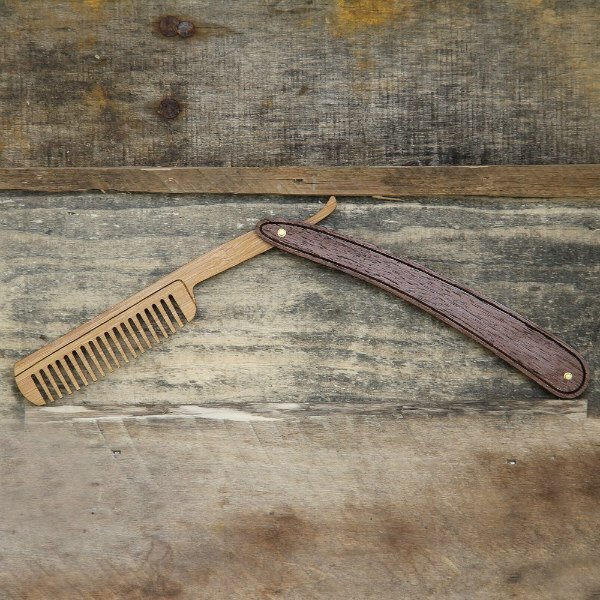 The bamboo comb blade conveniently flips out to reveal teeth to properly groom your beard and is appropriate for different phases of whisker growth. The smooth hardwood handle swivels 360 degrees, like a straight razor, to hit hard-to-reach areas and allow use with either hand while ensuring a handsome and healthy beard. Made from solid hardwood and 5-ply alternating bamboo layers that run perpendicular to each other for strength and durability, this little comb is pretty hardy and appropriate as an everyday carry. Folds neatly into its handle and rides well in your pocket or dopp kit. Guaranteed to tame the beard on any lumberjack, ship captain, or blacksmith.